Here’s the thing. I. Love. Granola. I love it with yoghurt, with fruit, with crème fraiche, with milk (that’s a lie- it tastes like sugared cardboard in milk), even with porridge. The list goes on. You could probably hand it to me on pizza, and I would happily sit and crunch. The versatile aspect of granola is, in my opinion, what’s made it become an extremely trendy breakfast. It can look so pretty served with fresh fruits and yoghurts and yummy arty farty foody things like chia seeds. However, due to the fact that most of us actually have very busy jobs and lives going on around our love for breakfast cereals, we don’t have the time to just quickly pop layers of granola, fresh yoghurt, fruit, seeds and rainbow dust in a tall glass whilst snapping and filtering it for Instagram. Instead, we have to settle for shop bought. This is actually a very sensitive topic for me. For a year and a half, I began a glorious affair with a particular brand of granola – shall not be named for fear of scary big brand hunting me down (just saying, if you think of the word corset, you might be on the right track) – specifically, the honey variety. This stuff, for anyone that hasn’t ever had it, is pretty glorious I won’t lie. It’s got what everyone wants in a good granola, the big bits, but is interspersed with seeds, pecans and sunshine as well. Tragically, my affair was interrupted by the crushing discovery via the app that NHS have just launched: ‘sugarsmart’, as part of their annoyingly fabulous change4life campaign. So there I sat, blissfully zapping, scanning and judging to my heart’s content, when I came across my beloved favourite shop-bought granola (rhymes with corset). 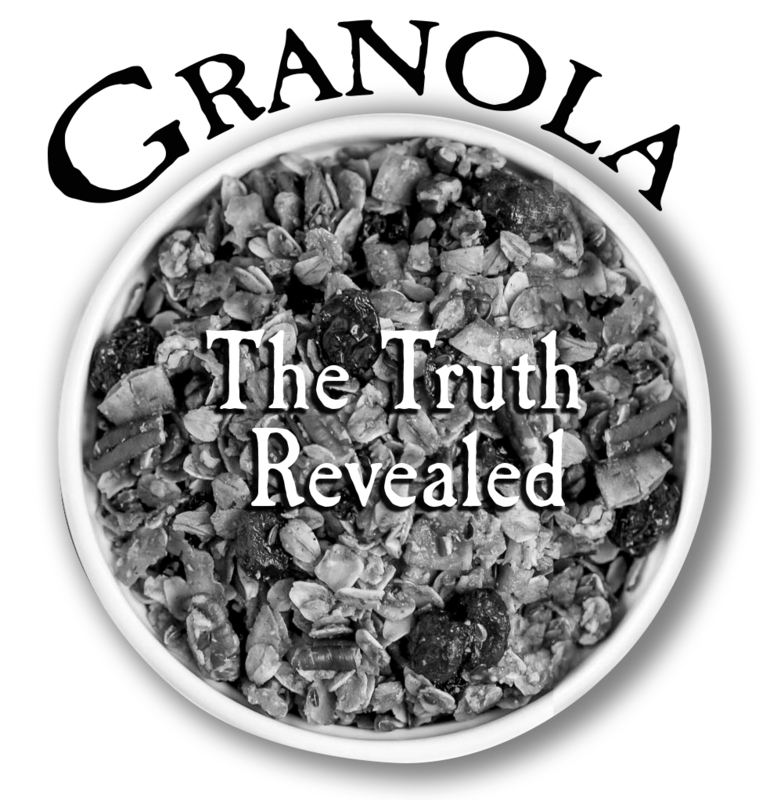 Now, here’s what irritates me about the granola industry. It’s marketed by the food industry as healthy and wholesome and fabulous, when in fact, it’s really not. I’m not even the kind of person that worries hugely about the amount of sugar consumed in my diet. Hand me a slice of M&S vanilla cheesecake, and I’ll become emotionally attached within the minute. But the amount of sugar in this particular granola was 28 SUGAR CUBES (!!!). I usually work by about 1tsp = 5g, so that’s nearly 6 teaspoons of additional sugar in a packet. I’m fairly sure the app should’ve alerted the NHS itself about this (either because of the sugar content or the fact that I nearly had an actual heart attack at the shock of it). I think what sparked my determination to boycott shop- bought granola, was not the amount of sugar within the cereals, but the false marketing of granola as a really healthy breakfast. Eating commercial granola every morning definitely won’t kill you (although the Daily Mail would absolutely SNAP that up) but to me, it now feels weirdly wrong. It made the industry almost appear cowardly for deceiving the consumer in a weird kind of way, by abusing the humble oat in order to make their products seem nutritious (although granola is no doubt a good source of fibre and carbs) it comes loaded with sweeteners and additives and grossness. After some slightly nerdy research into commercially made granola, I found that on average, a cup of homemade granola contains more energy, more fibre, more protein and less sugar than the commercial stuff. At the end of the day I think what we tend to forget is that the food industry is exactly that – an industry – and although many companies claim to want to do amazing things with their ingredients for the public health of the nation (which is – we can all admit- in a slightly shocking state at the moment obesity and CHD wise), what they really seem to prioritise rhymes with honey. My mission became to find a granola that was lower in sugar, and I thought surely this would be possible because it’s so healthy right? Nope. It seemed to only get worse. Shop-bought granola is FULL of sugar and chemicals, and I felt really really…betrayed as a huge granola fan. The more I looked into this weird, apparently pretty controversial corner of the food world, the more I realised that the people I beforehand deemed as fufu for making their own granola actually (mostly) do it for the nutrition. A lot of cereals are full of crap anyway, and whilst I’m not at all a fan of the avocado loving clean eating trend, I came to the conclusion that granola-wise, homemade might just be the best option. How hard can it be? So, whilst it’s true we don’t have time to do the whole pretty breakfast thing on a Monday morning when you need to down cereal in two minutes flat while also drying hair and getting dressed, I decided maybe it was high time for us all to make time for the sake of the nutrition. If the recipes are true, then making your own granola should actually take the same amount of time as a Friends episode.